If you’ve been following the mobile and social space, and especially if you own your own smartphone, you know the impact that that increased mobility means in terms of your ability to conduct business –- personal and professional –- while on the go. Now, IBM has some empirical data that indicates those behavioral changes due to smartphone adoption are occurring on a more massive scale. The IBM Retail Online Index, a cloud-based analysis of the online retail sector, integrates factual marketplace data from its analytics offerings, including the Benchmark, with insights from the IBM Social Sentiment Index, an advanced analytics and natural language processing tool that analyzes large volumes of social media data to assess public opinions. The combination of these two offerings provides the most accurate and immediate snap shot on the state of the online retail market. According to the latest IBM Retail Online report, mobile shopping rose while social media sales fell, providing an indication of where US retailers may invest in order to capture the attention and loyalty of the digital consumer. The IBM Retail Online Index reported that retailers experienced 15 percent growth in sales from mobile devices but saw a 20 percent decline in sales traced to social media based on a much smaller base over this three-month period. This report follows today’s news from the U.S. Department of Commerce’s Census Bureau which announced its estimates of U.S. retail and food services sales. According to the findings, retail sales fell 0.5 percent in June from May, the third straight month sales have been down from the month before. On a positive note, June 2012 sales were 3.8 percent above the pace of June 2011. IBM’s Retail Online Index identified several trends of importance to chief marketing officers (CMO), e-commerce leaders and customer service professionals. Over the second quarter consumers continued to embrace mobile devices as a shopping tool, with mobile commerce accounting for 15.1 percent of all online purchases, an increase of more than 14 percent. Despite this momentum retailers are still struggling to sustain substantial success with their social media efforts, evidenced by a more than 20 percent drop in social shopping. According to IBM’s State of Marketing 2012 survey, one explanation for social commerce’s failure may be the absence of a CMO and CIO alliance which is critical as marketing and online commerce become increasingly technology-driven. The lack of this alliance hinders the deployment of integrated technologies capable of fueling effective social media efforts. A second factor is marketing’s inability to form a clear consensus on how to utilize social channels. As a result, the retail online index saw a decline in positive sentiment around social media, which according to the online index dropped from 25.1 percent in Q1 to 18.6 percent in Q2. Leading factors for this shift were the lack of deals being offered by retailers through these channels, which were more prevalent in Q1. Over the second quarter, while online traffic and sales for Q2 were down 6.7 percent and 2.3 percent from Q1 respectively, there were signs of optimism. Specifically, for completed orders, shoppers bought more items (average items per order grew 2.6 percent) and spent more for each transaction (average order values for each purchase grew by 2.3 percent) over the second quarter. Consumer Spending: Total online sales for the quarter were down 2.3 percent over Q1 2012. Average Order Value: The average value for each order in Q2 grew by 2.3 percent. Items Per Order: The average number of items per order increased by 2.6 percent. Page view Per Session: Page views per session dropped by 2 percent to 6.4 pages. Mobile Sales: Sales from mobile devices reached 15.1 percent, up from the 13.3 percent in Q1 2012. Mobile Devices: While Apple’s iPhone continued to rank one for mobile device retail traffic at 8.2 percent, Android surpassed the iPad which finished at 6.8 percent and 6.7 percent respectively. Social Traffic: Shoppers referred from social networks generated 1.3 percent of all online traffic over Q2 2012, a slight increase from the 1.1 percent seen the previous quarter. Social Sales: Shoppers referred to retailer sites from social networks generated 1.9 percent of all online sales over Q2 2012, a decrease from the 2.4 percent seen in Q1. Consumers further intensified their focus on the home with home goods sales growing by 35.3 percent in Q2. Jewelry stores maintained its upward track with sales growing by 1.4 percent. Social Media: A potential result of retailers failing to deliver compelling campaigns through these channels, positive sentiment around social media dropped by 6.5 percentage points, from 25.1 percent in Q1 to 18.6 percent in Q2. Loyalty and Pricing: Where sales and clearing inventory were priorities in Q1, retailer prices returned to more normal rates in Q2, a shift that fueled negative sentiment around pricing which grew by 2.1 percentage points. These factors also impacted consumer loyalty where negative sentiment grew by 2.1 percentage points. IBM’s Smarter Commerce initiative delivers software and services to help companies transform their business processes to more quickly respond to shifting customer demands in today’s digitally transformed marketplace. The initiative is driven by the demands from organizations who are increasingly looking for ways to bring new levels of automation to marketing, sales and fulfillment to secure greater customer loyalty. The growth of mobile, social and online commerce are key trends within Smarter Commerce. You can learn more about IBM’s Smarter Commerce initiative here. The IBM Intranet Experience Suite pulls together company information and data, personalized content and news, and social media and analytics, enabling employees to connect, collaborate and access information at anytime, from anywhere. IBM today announced new software that helps CMOs and CIOs transform the digital experience for employees, customers and fans across a broad range of mobile devices. By 2017, the CMO will have greater control of the IT budget than the CIO, according to Gartner. Marketing budgets will grow 7-8 percent over the next 12 months, which is 2-3 times that of IT budgets. With the growing number of mobile devices, social networks and social media tools on the rise, CMOs struggle to reach their audiences. At the same time, CIOs are struggling to provide access to company data on every type of device for a geographically distributed workforce. Given the business realignment between marketing and technology, the CMO and CIO can no longer afford to operate on separate stages. To succeed, they’ll have to forge a shared agenda to deliver business results through innovation and efficiency, working together to streamline their technology needs. The convergence of social and mobile is prompting organizations to revisit decades-old website to create exceptional web experiences to reach and engage with their audiences. And despite their growing reliance on technology and their soaring budgets, CMOs readily admit they lack the skills that IT requires. According to the IBM CMO Study, while 79 percent of CMOs expect high levels of complexity in their job over the next five years, only 48 percent feel prepared to deal with it. Building on these increased demands, IBM is delivering a new Customer Experience Suite giving millions of marketing professionals the power to manage and integrate all types of data on their web sites and then analyze it for deeper insight into customer buying patterns and sentiment. Also delivered today, the new IBM Intranet Experience Suite pulls together company information and data, personalized content and news, and social media and analytics, enabling employees to connect, collaborate and access information at anytime, from anywhere. The new IBM Intranet Experience software brings together the power of social networking, analytics and mobile computing to front office operations and externally to clients, allowing companies to create exceptional Web experiences. As a result, organizations can gain faster insight on customer buying patterns and consumer sentiment allowing them to more quickly reach and engage their audiences. At European industrial automation technology manufacturer Omron, employees are connecting knowledge and technical know-how through the organization’s Intranet, helping to meet the specific needs of their customers. Omron delivers an exceptional Web experience through a single communication platform that embeds relevant social data into the daily workflow. Omron has sped knowledge sharing across boundaries and between departments, enabling employees to support customers better and faster. Working with IBM and its partner Portico, Omron created an award-winning business intranet, called Ozone internally, helping to create a single-source communication and collaboration platform for all 1,700 European employees. The IBM Intranet Experience Suite integrates with external social media, including Twitter, LinkedIn and YouTube, allowing employees to pick and choose which applications they want in their Intranet view. For example, a sales manager can leverage the Cognos software integration to ensure a clear view into monthly sales reports by region, as well as competitive background on new product updates and forecasts. From digital marketing and mobile commerce, to websites and social media, marketers are inundated — often paralyzed — by data amassed from consumers via searches, purchase histories, Facebook “likes” and comments on Twitter. Combine that with data about in-store traffic, conversations with call centers and updates from suppliers, today’s marketers confront a daily deluge of data waiting to be sifted for nuggets of intelligence they can act upon to boost their business. Because of this, it’s critical for CMOs to not only be aware of and monitor the social conversation, but to truly understand the sentiment and interact one-on-one with that customer. Taking it one step further would be to integrate these conversations directly into the organization’s web site, providing one place to both network and shop. The new IBM Customer Experience Suite provides CMOs with the power to manage and integrate all types of data on their web sites and then analyze it for deeper insight into customer buying patterns and sentiment. Web data has evolved today to include social media, videos, and web-based forms, as well as traditional enterprise data such as financial, customer and order data, and transactions. The software suite pulls together IBM’s market-leading enterprise portal, web content management, forms, and enterprise social networking software into a single view. According to IDC, employees typically see up to a 30 percent increase in productivity using social tools internally to complete their work. With unlimited access to any type of information, consumers expect this same level of information availability in their professional lives, in order to work efficiently and reach business goals quickly. You can learn more about the IBM Intranet Experience Suite here. I’m back from IBM Impact 2012…but my brain is still processing all the information I took in through all the interviews Scott and I conducted for ImpactTV and for all the sessions I attended…and I won’t mention all the cocktails in the evenings where I learned SO much from my industry peers. The first ever IBM security officers study reveals a clear evolution in information security organizations and their leaders with 25 percent of security chiefs surveyed shifting from a technology focus to strategic business leadership role. I’ll be putting together a recap post of some of the major announcements, and I’ve still yet to transcribe my interview with Walter Isaacson, but first, I wanted to highlight an important new study from IBM on the security front. For those of you who follow the Turbo blog, you know the issue of security (particularly cybersecurity) is one I take very seriously and that I follow closely, partially because of my longstanding interest in the topic, and partially because I recognize we live in an imperfect world using imperfect technology, created and used by imperfect humans. But the promise and hope for security, fallible though it may sometimes be, is a worthy aspiration. There are ideas, assets, and often even lives at risk, and the more we move up the stack into an intellectual capital driven global economy, the more there is at stake and the more that will be needed to protect. So, that’s a long way of saying expect to be hearing even more from me on this important topic. To that end, now for the new information security study results. The new IBM study reveals a clear evolution in information security organizations and their leaders, with 25 percent of security chiefs surveyed shifting from a tech focus to one of a more strategic business leadership role. In this first study of senior security executives, the IBM Center For Applied Insights interviewed more than 130 security leaders globally and discovered three types of leaders based on breach preparedness and overall security maturity. Overall, all security leaders today are under intense pressure, charged with protecting some of their firm’s most valuable assets – money, customer data, intellectual property and brand. Nearly two-thirds of Chief Information Security Executives (CISOs) surveyed say their senior executives are paying more attention to security today than they were two years ago, with a series of high-profile hacking and data breaches convincing them of the key role that security has to play in the modern enterprise. More than half of respondents cited mobile security as a primary technology concern over the next two years. Nearly two-thirds of respondents expect information security spend to increase over the next two years and of those, 87 percent expect double-digit increases. Security seen as a business (versus technology) imperative: One of the chief attributes of a leading organization is having the attention of business leaders and their boards. Security is not an ad hoc topic, but rather a regular part of business discussions and, increasingly, the culture. In fact, 60 percent of the advanced organizations named security as a regular boardroom topic, compared to only 22 percent of the least advanced organizations. These leaders understand the need for more pervasive risk awareness – and are far more focused on enterprise-wide education, collaboration and communications. Forward-thinking security organizations are more likely to establish a security steering committee to encourage systemic approaches to security issues that span legal, business operations, finance, and human resources. Sixty-eight percent of advanced organizations had a risk committee, versus only 26percent in the least advanced group. Use of data-driven decision making and measurement: Leading organizations are twice as likely to use metrics to monitor progress, the assessment showed (59 percent v. 26 percent). Tracking user awareness, employee education, the ability to deal with future threats, and the integration of new technologies can help create a risk-aware culture. And automated monitoring of standardized metrics allows CISOs to dedicate more time to focusing on broader, more systemic risks. Shared budgetary responsibility with the C-suite: The assessment showed that within most organizations, CIOs typically have control over the information security budget. However, among highly ranked organizations, investment authority lies with business leaders more often. In the most advanced organizations, CEOs were just as likely as CIOs to be steering information security budgets. Lower ranking organizations often lacked a dedicated budget line item altogether, indicating a more tactical, fragmented approach to security. Seventy-one percent of advanced organizations had a dedicated security budget line item compared to 27 percent of the least mature group. To create a more confident and capable security organization, IBM recognizes that security leaders must construct an action plan based on their current capabilities and most pressing needs. The report offers prescriptive advice from its findings on how organizations can move forward based on their current maturity level. For example, those “Responders” in the earliest stage of security maturity can move beyond their tactical focus by establishing a dedicated security leadership role (like a CISO); assembling a security and risk committee measuring progress; and automating routine security processes to devote more time and resources to security innovation. 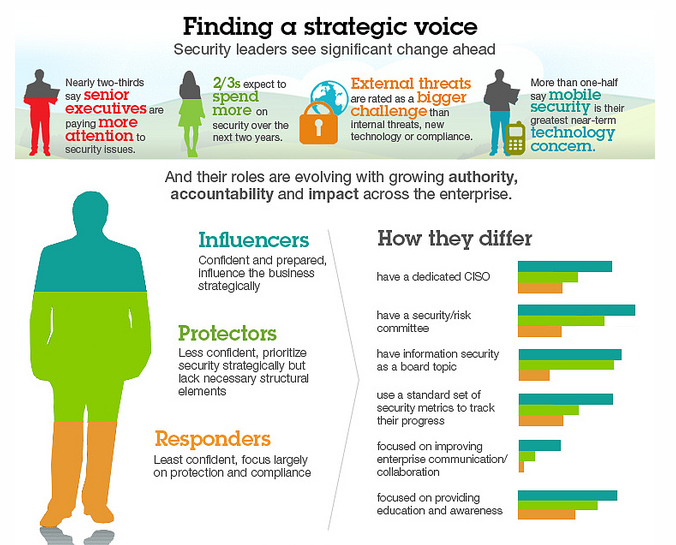 The IBM Center for Applied Insights study, “Finding a strategic voice: Insights from the 2012 IBM Chief Information Security Officer Assessment,” included organizations spanning a broad range of industries and seven countries. During the first quarter of 2012, the Center conducted double-blind interviews with 138 senior business and IT executives responsible for information security in their enterprises. Nearly 20 percent of the respondents lead information security in enterprises with more than 10,000 employees; 55 percent are in enterprises with 1,000 to 9,999 employees. I mentioned the coming announcement about our new expert integrated systems in my last post, and lo and behold, the details arrived overnight. This effort is the result of $2 billion in research and development, along with acquisitions, over four years, and represents an unprecedented move by IBM to integrate all IT elements, physical and virtual. This effort is also about a new offering. This new systems family offers IBM customers an alternative to today’s enterprise computing model, where multiple and disparate systems require huge resources in set-up and ongoing maintenance. The current economics and models have far too many focused too much on the small stuff. Companies worldwide spend an average of 70 percent or more of IT budgets on simple operations and maintenance, which leaves them precious little time to invest in innovation. Furthermore, two-thirds of corporate IT projects are delivered over budget and behind schedule, according to a recent study by IBM. That same said study also found that only one in five corporate IT departments are able to spend the majority of their IT budget on innovation. 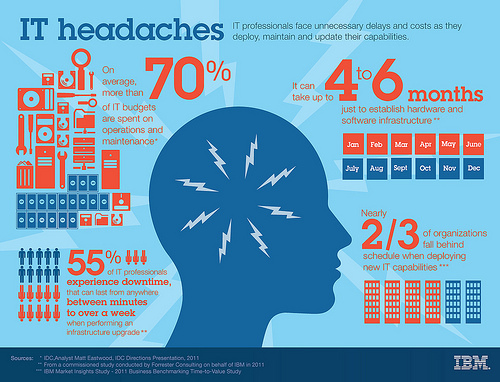 The infographic details many of those IT headaches and challenges facing so many today. The prime challenge facing companies worldwide is the need to spend 70 percent or more of IT budgets on simple operations and maintenance, leaving little to invest in innovation. Two-thirds of corporate IT projects are delivered over budget and behind schedule, according to a recent study by IBM which also found that only one in five corporate IT departments are able to spend the majority of their IT budget on innovation! “Scale-In” System Design: With PureSystems, IBM is introducing a new concept in system design that integrates the server, storage, and networking into a highly automated, simple-to-manage machine. Scale-in design provides for increased density – PureSystems can handle twice as many applications compared to some IBM systems, doubling the computing power per square foot of data center space. Patterns of Expertise: For the first time, IBM is embedding technology and industry expertise through first-of-a-kind software that allows the systems to automatically handle basic, time-consuming tasks such as configuration, upgrades, and application requirements. Cloud Ready integration: Out of the box, all PureSystems family members are built for the cloud, enabling corporations to quickly create private, self-service cloud offerings that can scale up and down automatically. “With its new scale-in design and built-in expertise, PureSystems represents an important advance in the evolution of computing,” said Steve Mills, senior vice president and group executive, software and systems, IBM. The first two models of the PureSystems family – PureFlex System and PureApplication System — start shipping to customers this quarter. PureSystems support POWER processors and Intel processors. For more information visit the IBM expert integrated systems blog and be sure to follow the #puresystems Twitter hashtag to follow the emerging conversation around this breakthrough new approach to IT. If you were wondering what your CEO was doing all day, you need wonder no longer. A story in today’s Wall Street Journal cites a research study conducted by the London School of Economics and Harvard Business School entitled the “Executive Time Use Project” reveals that CEOs spend about a third of their work time in meetings. Funny, I would have thought a third of their time was spent on airplanes! And, more importantly, can they be more efficient with their time? On average, some 85 percent of a CEO’s time was spent working with other people, with only 15 percent spent working alone. The time CEOs spent with outsiders had no measurable impact on firm performance. But, time spent with other people inside the company was strongly correlated with positive increases in productivity. In companies with stronger governance, CEOs spent more time with insiders and less time with outsiders, and at the same time were more productive. So how else did they spend their time? In total, some 85 percent was spent working with other people through meetings, phone calls, and public appearances. Of that precious time spent with others, 42 percent was spent with only “insiders,” 25 percent with insiders and outsiders together, and 16 percent with only outsiders. The time spent with insiders, however, was strongly correlated with productivity increases. For every 1 percent gain in time spent with at least one insider, productivity advanced 1.23 percent. Not so reassuring was the fact that the time CEOs spent with outsiders had no measureable correlation with firm performance. Turbo’s Translation: Focus on meeting with your more senior troops, skip some of the speaking engagements, and be very discriminating about the biz dev meetings you take. IBM has released its most recent study of more than 3,000 global CIOs. The Global CIO study, last conducted in 2009, includes a range of interesting sound bytes, but here’s the lead: 60 percent of organizations are ready to embrace cloud computing over the next five years, a figure nearly double that of the 2009 study. What explains that doubling of interest in cloud computing? As the amount of information companies and consumers generate increases, companies are seeking simple and direct access to data and applications that cloud computing delivers in a cost-efficient, always-available manner. Also, though early cloud deployments typically began in an intra-departmental paradigm, use has now become more common between organizations and their partners and customers. From a global perspective, seven out of 10 CIOs in the U.S., Japan, and South Korea, and 68 percent in China, now identify cloud as a top priority. In 2009, CIO interest in cloud computing hovered at around a third in these countries. The latest CIO study also found that more than four out of five CIOs (83 percent) see business intelligence and analytics as top priorities for their businesses as they seek ways to act upon the growing amounts of data that are now at their disposal. Mobile computing was also a central theme, with nearly three-quarters (74 percent) of CIOs seeing mobile computing and mobility solutions as a game-changer for their businesses. Analytics and business intelligence hold the most interest in the chemical and petroleum, consumer products, and healthcare industries, with CIOs from each of those industries citing it as part of their plans to increase competitiveness over the next three to five years. Mobility solutions were identified most in the travel (91 percent), media and entertainment (86 percent), and energy and utilities (82 percent) industries. Risk management is a top issue in the finance and banking industries, where more than 80 percent of CIOs said they are focusing their attention. Simplification is a key issue for CIOs, as more than 80 percent said they plan to lead projects to simplify internal processes. A wide array of innovative methods and tools are being sought to turn “big data” into real, actionable information. This ranges from master data management (68 percent) to client analytics (66 percent), data warehousing and visual dashboards (64 percent) and search capabilities (59 percent). The report also highlights a number of recommendations, ranging from strategic business actions and use of key technologies that IBM has identified that CIOs can implement, based on CIO feedback from the study. The full 2011 CIO Study and interviews are available here. IBM’s 2011 study, the definitive study of trends among chief information officers, is the product of face-to-face interviews with CIOs from diverse organizations in 71 countries, 18 industries and organizations of every size. The study, titled “The Essential CIO,” reinforces the increasingly strategic role that CIOs are playing as leaders of innovation and growth. The study is being released in IBM’s centennial year as the company marks the historic role it played in both establishing the need for CIOs in the 1950s and 1960s — the early days of business computing — and elevating the position over the ensuing decades to give a voice to IT in the C-suite.